At first I thought this was just the usual Shaft weirdness. But I stumbled on a blog post that attempted to explain all the symbolism behind the imagery in this scene. According to the author of the blog, the empty chairs represent fallen Magical Girls. While the author's interpretation is plausible, I also found it somewhat tenuous—the only evidence the author gives is the scene in Mami's apartment earlier on, when Madoka sees Mami's furniture and bursts into tears. I don't have a very clear memory of the scene, but I don't remember it focusing specifically on the furniture—it could just as well have been the empty apartment. Is there any other evidence in the show that supports this blogger's reading? 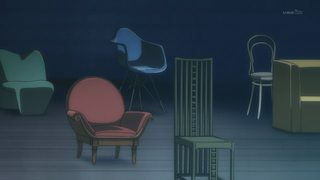 And is there evidence that supports another meaning for the scores of empty chairs in Madoka's room? 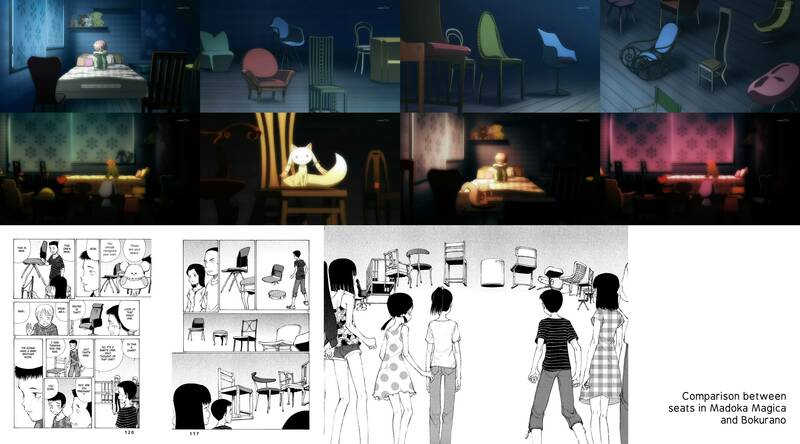 Those chairs are a direct reference to Bokurano, understanding which actually adds depth to the scene (if you've seen Bokurano). Childs sitting on the chairs are actually giving up their lives for the privilege of fighting a defence of Earth. 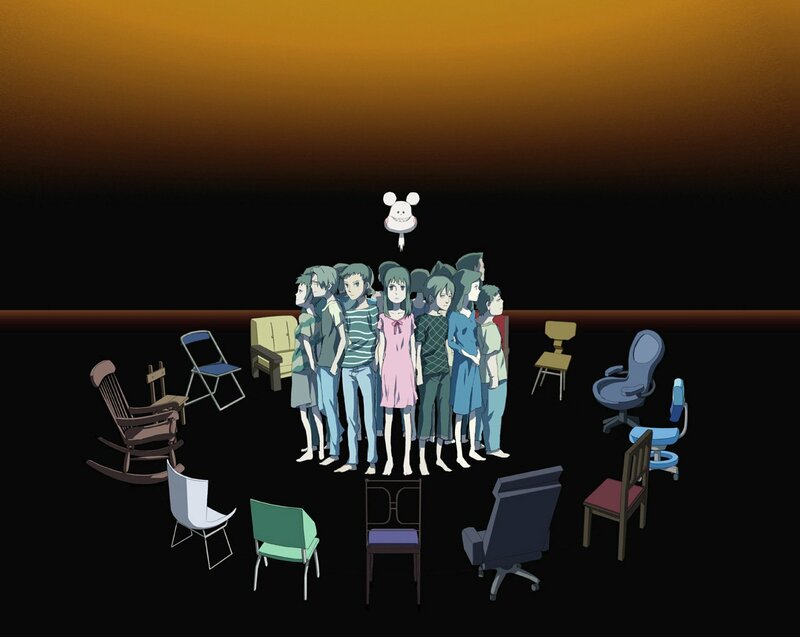 Note that chairs appear before the big reveal about souls and zombies in Madoka. Bokurano features a small white-colored mascot type character representing an alien race beyond human comprehension. This alien involves the main characters - mere schoolchildren - in a series of battles in which those chosen by the alien fight monstrous creatures in order to save ordinary people. Halfway through the series, in a shocking twist, it is revealed that these 'evil' and 'monstrous' enemies (robots) are in fact piloted by people in the same situation as the main characters, that the aliens have engineered the battles and the threat themselves, and it's all ultimately part of a scheme seeking to use humanity as an energy source. Towards the end of the series, this mascot character can be observed pressuring a quiet little girl into making an 11th-hour "contract" to give up her life for the sake of her universe, even though she has seen friends die in this same fight and is quite clear that there is no way out of this contract besides her death. Madoka is in many ways an homage to Bokurano, and besides being clever foreshadowing for the few who had watched the series, the chairs are there to acknowledge the fact and pay respect to this earlier series. Not the answer you're looking for? Browse other questions tagged madoka-magica symbolism or ask your own question. Are all wishes actually possible? What's the range of a witch's barrier? What is the meaning of the cake song? How was Homura able to lure all of the magical girls into her labyrinth in Rebellion?